Huoneisto sijaitsee rakennuksessa, joka on täysin kunnostettu 1825, joka sijaitsee kaupungin historiallisessa kypärässä. Thyssen-museon läheisyydessä. Lähellä Calle Larios ja Plaza de la Merced. Hyvin keskeinen alue ja samalla erittäin hiljainen, ei melua. Lähellä satamaa ja rantaa. Rakennus täysin mukautettu, hissi, ilman arkkitehtonisia esteitä. Ulkolattia, erittäin valoisa, jossa on olohuone, jossa on mukava vuodesohva 1,40 leveä ja kaksi ihmistä. Romanttinen makuuhuone parivuoteella. Kaksi parveketta, Climalit-sulkimet. Täysin varusteltu keittiö, jossa on kaikki tarvittavat keittovälineet, jääkaappi, pakastin, pesukone, mikroaaltouuni, liesi ja liesituuletin sekä kylpyhuone hiustenkuivaajalla. Se on Led-TV ja Wi-Fi-internetyhteys. Pehmeät egyptiläiset puuvillaiset vuodevaatteet ja pyyhkeet. Málagan karttoja ja tietoa mielenkiintoisimmista kulttuuri- ja vapaa-ajan aktiviteeteista ovat milloin tahansa saatavilla sekä apuna kaupungin tunnetuimmista ja gastronomiselta mielenkiintoisimmista paikoista. Siellä on kaikki tarvittavat palvelut lähellä, kuten Atarazanas Market, kahvilat, ravintolat, muotiliikkeet, kaupunkibussilinjat ja lähellä Centro-Alameda Cercanías rautatieasemaa, joka yhdistää lentokentälle. 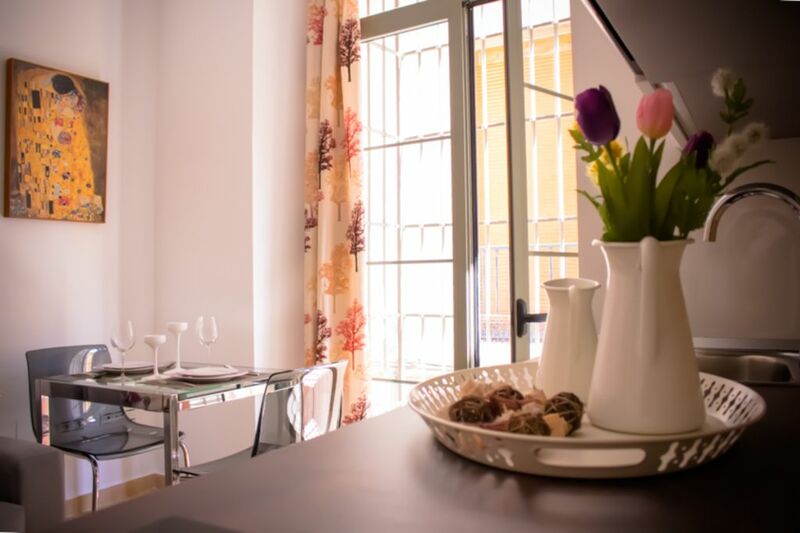 Lovely compact apartment in Malaga old town! Very clean and well equipped. Joaquin and Alvaro were really helpful and provided us with all the basics for breakfast the following morning. Will definitely return! John and Susan are a very nice couple, perfect guests. They have been polite, liable and ordered. It shall be a pleasure receive them again in my appartment when they wish. I recommend them totally. I'm glad they had a pleasant stay and that they enjoyed the central location, the equipment and the peace of the flat. Perfecte locatie. Schoon, nieuw en smaakvol ingericht appartement met alles d’r op en d’r aan. Een aanrader! Great apartment on the edge of the old town. The owner and son was there to greet us on our arrival. They showed us around the apartment and gave us useful information about Malaga . The apartment is very clean and well furnished with everything you would need. We would definitely return again. Steve and Clare have been guests polite, liable and ordered. It shall be a pleasure receive them again in my appartment when they wish. I recommend them totally. I'm glad they had a pleasant stay and that they enjoyed the central location and, at the same time, peace of the flat. Great little apartment right on the edge of the old town. Walking distance to all the main attractions within 10 minutes - once you get your bearings. Apartment is well equipped with quality fittings/equipment - even dispenser in shower stocked with gel. Means if only a few days away to take in the city hand luggage is all you need. Decided from the outset we'll be returning so scaled back our sight seeing to a leisurely pace - be looking first at this apartment to book when we return. Michael and Barbara have been good guests. I'm glad they had a pleasant stay and that they enjoyed the central location, its equipment and, at the same time, peace of the flat. I totally recommend them, they are very friendly. I hope to see them soon. Our stay was great. The apartment was fantastic. Really clean with everything we needed. The communication with Joaquin and his son was excellent and the initial information. I would highly recomend staying here. So much more room than a hotel and the location was perfect. When we return to Malaga again we will definitely stay here. Thank you!! Michael and Karolina have been good guests. I'm glad they had a pleasant stay and that they enjoyed the central location and, at the same time, peace of the flat. I totally recommend them, they are very friendly. I hope to see them soon. Lovely apartment in a good location with all you need. Alvaro was there to meet us and took time to run us through the apartment and things to do in the locality. We had a lovely stay Alvaro. Thank you. Michele and Philip have been good guests. I'm glad they had a pleasant stay and that they enjoyed the central location and, at the same time, peace of the flat. I totally recommend them, they are very friendly. I hope to see them soon. El apartamento cuenta con todas las comodidades para la estancia de cuatro personas. La mesa de comedor es extensible y cuenta con el mobiliario auxiliar necesario. Disponen de sábanas, toallas, plancha y mesa de planchar, tostadora, cafetera, hervidora, microondas, vitrocerámica, lavadora y también tiene aire acondicionado con frío y calor. Se les dá información detallada sobre los lugares a visitar, los monumentos y museos de Málaga, así como de gastronomía, ocio o cualquier otro lugar que quieran visitar.